Though no longer a runner, I own a pair of Nike running shoes. 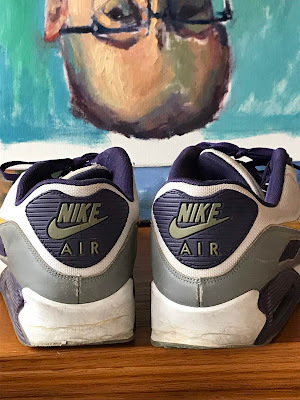 Those shoes (pictured: my sole Nike soles and purposeful upside portrait) gifted to me a handful of years ago by an NCAA national champion wrestler who enjoys ongoing recognition from Nike for his achievement. The shoes. Only the shoes. Nothing else Nike do I own. And it's been at least two years since wearing the shoes. In morning news was Nike's support of and new ad featuring NFL player Colin 'the kneeler' Kaepernick. And with that decision, business surely, three words - Nike and Colin Kaepernick - enjoy foremost visibility in the public domain; the best advertising possible. The bean counters must have concluded revenue will (eventually) trump losses. Surely. I've not watched an NFL game in at least 30 years. Personally, the pro game has not been the same since colorful Joe 'Willie' Namath quarterbacked the NY Jets - and against all odds won the 1968 Super Bowl on Sunday, 14 January - 11 days before Nike celebrated it's 4th anniversary. In those days Noxzema, not Nike, big. And Joe endorsed them by taking it all off. His famous fu manchu, that is. I've not seen, of course, Colin Kaepernick play. And for the absences, life wonderfully enriched. When I was active in sports the (running) footwear of choice, in no particular order, was New Balance, Adidas, Puma, Brooks, et al. and once in a while Nike (if on sale). It's been decades since buying Nike anything. The kneeling before our colors and anthem fad Colin Kaepernick inspired is dumb and sickening. Pros, college and high school and little league players, cheerleaders, and anthem singers have followed his miserable example. While Kaepernick nor anyone has articulated, intelligently, justification for the behavior - that facts fail to support their disrespectful act. So choose other than the swoosh. Fall for products adorned with our beautiful flag. Will Nike have shot themselves in the foot - in one fell swoosh? Yes Col Andy, we live in a country where all have choices, possibly far too many in my Economist trained view, but I digress somewhat. My bet is they (Nike) will regret this decision, and probably fire the imbecile who fathered the idea. I, like you, do not watch the NFL or any pro-sport, except for the WNBA (my bride's FAV), no knee bending there, yet. Nor do I own anything sporting the word Nike, nor will I in the future, I prefer UA. Semper Fi my brother, good post. Let's not forget that Kaepernick's first protest was sitting during the national anthem. I'm guessing that he was advised that kneeling would be a better approach.